NOVA PEARLS ™ Medicated Dandruff Shampoo is a therapeutic shampoo that contains 2% sulfur and 2% salicylic acid — the antiseborrheic medication recommended by veterinarians — to relieve excessive dryness, flaking and itching in dogs and cats, as it cleanses and moisturizes. Only NOVA PEARLS ™ offers a revolutionary line of pH-balanced dry skin treatments enriched with slow-release Power Moisturizers ™ encapsulated in Novasome ® microcarriers to keep skin moisture-rich for days after use. Shake well before use. Wet the animal’s coat thoroughly. Work shampoo into the coat until a mild lather is produced. Let stand for 5 to 10 minutes before rinsing thoroughly. Repeat as required, depending on the severity of the condition. 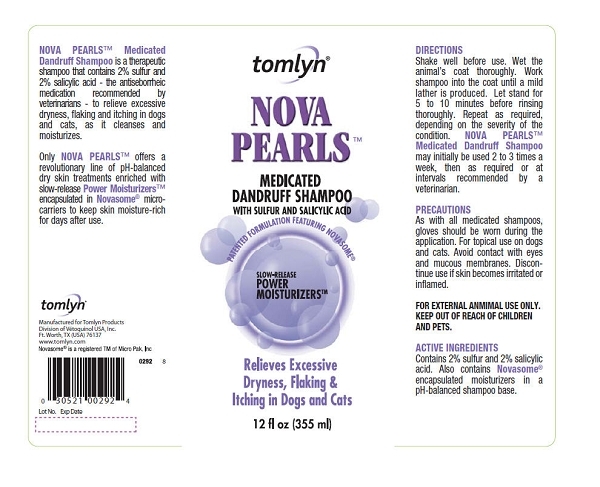 NOVA PEARLS ™ Medicated Dandruff Shampoo may initially be used 2 to 3 times a week, then as required or at intervals recommended by a veterinarian. For over 30 years, Tomlyn has been caring for pets. This company offers pet owners one of the most comprehensive line of veterinarian formulated pet health products on the market. Pet lovers around the world have learned to rely on Tomlyn because of their high quality standards and popular pet care product lines. Tomlyn is dedicated to quality and is the preferred choice among discerning pet owners.